Blackhawk! Cyclone Patrol Pack in plain Olive Green (1000D Cordura). 32 litre capacity for main pack. Complete with 3 litre hydro bladder, hose and bite valve. External MOLLE strapping for additional pouches. 3x antennae/cable ports, separate bladder pocket. 2 external zipped pockets, plus internal mesh pockets. Zip closures on all pockets. 'Cyclone' Patrol Pack from Blackhawk's 'Hydrastorm' Hydration range. A popular private purchase item with SFSG. Extremely robust and streamlined pack ideal for current operational needs and environments. 32 litre capacity pack with removable 3 litre Hydrastorm hydration bladder and hose. Exterior is covered in MOLLE loops for the Blackhawk! 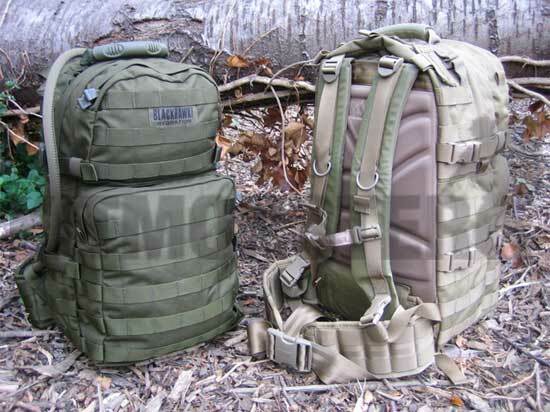 STRIKE system or similar MOLLE items. Large main compartment suitable for patrol kit and an internal pocket for laptop or radio. 2 way crescent zip access plus 3 antenna/cable ports. 2 external pockets, both with 2 way zips. Lower pocket has velcro type lining and loops for kit or MOLLE attachments. Removable waist belt also with STRIKE attachments. IVS moulded back provides superior comfort, air flow and stability. This type of back panel seems to be unique to Blackhawk! packs. Ergonomically shaped and padded shoulder straps with chest strap and quick release. Rubber covered grab/drag handle at top and drainage eyelet in base. Hydrastorm hydration system is contained in a separate compartment. System comprises 3 litre bladder with antimicrobial technology for your protection. Colour keyed neoprene covered hose with proven bite valve. Two views shown, single pack supplied. This is a Tier One item, and among the very best of our range. See our glossary for more information about our Tier ratings.